The new Irvine, Ca. Starbucks serves Blizzard employees incredible drinks. What started as a small Seattle coffee shop has turned into one of the most popular coffee shops in the world. Starbucks now has over 25,000 locations across the globe, and one company is now getting special treatment. Blizzard Entertainment, software development company behind the massive gaming titles World of Warcraft, Diablo, StarCraft, and Overwatch, has opened their own Starbucks at their Irvine, California headquarters. Blizzard was already one of the coolest companies in the world to work for. Employees are allowed to bring their dogs to work, get free copies of every game ever released plus free game time to gift to friends, have access to volleyball courts, and get invited to the hottest gaming parties and conventions. Opening an on-site Starbucks was not only a genius move for caffeine-dependent programmers, but the drinks on offer make this location almost legendary. An Instagram account launched on May 23rd, 2017 showcases the exclusive range of drinks on offer to the California residents. So of course, the internet is on fire. Coffee and Blizzard Entertainment lovers alike are endlessly jealous of Blizzard employees. You can still get your favourite tall americano or grande orange mocha frappuccino along with any special offer Starbucks has on. Current special offers are the Midnight Mint Mocha and the S’mores Frappuccino. I mean, those sound delicious, right? 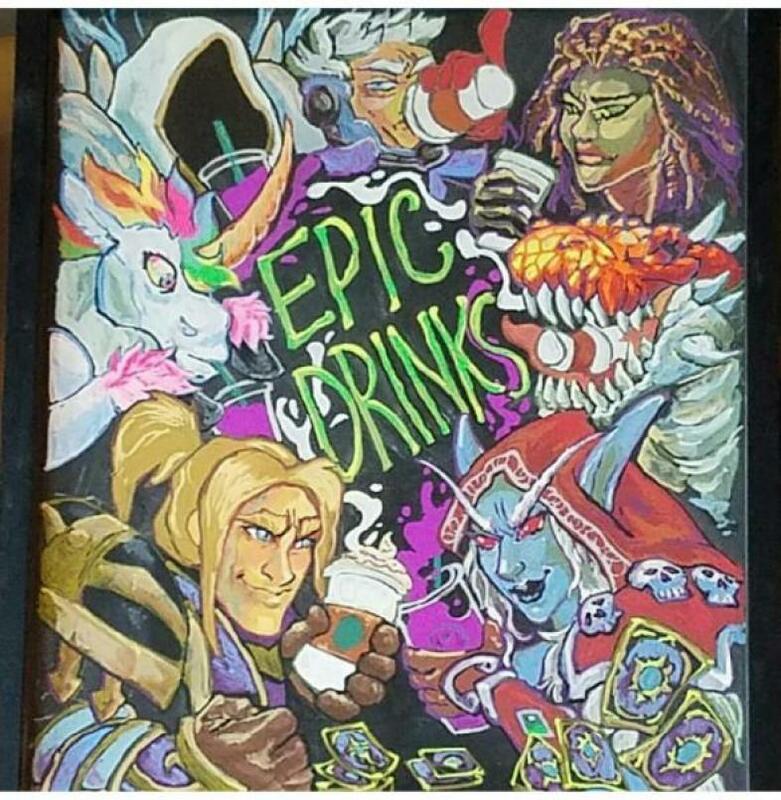 Starbucks showcase their epic drinks with talented artwork on their Instagram page. The Irvine Starbucks offers a special range of drinks based on the many Blizzard Entertainment titles. Like the EPIC drink! A cold frothy blend of passion tea, raspberry, vanilla, and soy milk that’s sure to refresh you on those warm California days. Or something to warm you up, you can try The Blizzard Drink, the locations take on Starbuck’s Zebra Mocha, with white and dark mocha sauce, whipped cream, caramel drizzle, and chocolate chips. Sounds like a total sugar rush and I am in. The Zerg are a playable race in StarCraft. Or you could join forces in the Starcraft themed drink, Zerg Rush. Another cold offering of a mocha frappuccino with blackberries, a hint of peppermint, and some bright green matcha puree. WIth professionally trained baristas working full-time, the coffee and tea flavour combinations are endless. I’m thinking they should steam some fresh cinnamon with oat milk and pour it into a salted caramel latte base and call it Uther’s Lightbringer. Hey, Starbucks! Hire me and ship me to California! Most people are loving them. With 1370 followers on instagram and 4700 employees across the globe, I’d say they are doing great. Blizzard CEO and senior game developer responsible for bringing us Overwatch was left disappointed after receiving this common drink not long after opening. Jeff Kaplan sharing the misspelling of his name, and in true style, the internet is funny.